Dr. Michael R. Schwartz talks about the wide variety of choices for women considering breast augmentation and gives advice on things to keep in mind when choosing between sizes, shapes, and types of breast implants. Dr. Schwartz says there are six things to keep in mind when choosing between breast implants: the company who manufactures the specific implant; the surface of the implant (smooth or textured); the shape of the implant and how it can best fit one’s physical anatomy; the projection of the implant; implant volume, which will determine the size; and the implant’s base diameter, which Dr. Schwartz says may be the most important measurement in order to ensure it will fit properly on the patient’s frame. For many patients, Dr. Schwartz says he often recommends textured, anatomically shaped breast implants over smooth implants. 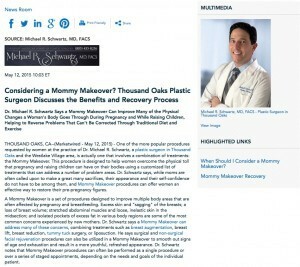 “Besides a more beautiful result, the use of textured implants helps me control the shape and position of the breasts in a way that I find more reliable and longer-lasting than smooth implants.” However, he reiterates, the type of implant that’s best for one’s needs and goals will ultimately depend on each patient. During the initial consultation at Dr. Schwartz’ practice, he shares pictures of results from specific implants and utilizes the Mentor™ Volumetric sizing system and the VECTRA® 3D imaging system to help patients visualize the potential results of different types of implants and give them a better idea of what they may look like after the procedure. Dr. Schwartz says, by meeting with a board-certified plastic surgeon, women who are considering breast augmentation can be presented with the choices and given thorough explanations of how each option can be advantageous or disadvantageous to their goals. He says, by exploring how certain implants can benefit their individual needs, patients can increase the chances of having beautiful results. Dr. Michael Schwartz is certified by the American Board of Plastic Surgery as well as the American Board of Surgery. He is a Fellow of the American College of Surgeons, and a member of the American Society for Aesthetic Plastic Surgery, the American Society of Plastic Surgeons, the Los Angeles Society of Plastic Surgeons, and other organizations. Dr. Schwartz has authored many papers on plastic surgery and has lectured at numerous meetings and conferences nationwide. His plastic surgery practice in the Thousand Oaks and Westlake Village area offers a comprehensive range of surgical and non-surgical procedures, including facelift, liposuction, breast surgery options, and skin care treatments. Dr. Schwartz is available for interview upon request.